Jaded Blossom: Guest Designer, Debbie! I am so happy to be the guest designer for the Jaded Blossom I just love these gals, and there stamps are just so much fun to work with. This is such a busy time of the year for so many of us, as we're getting ready for Christmas. 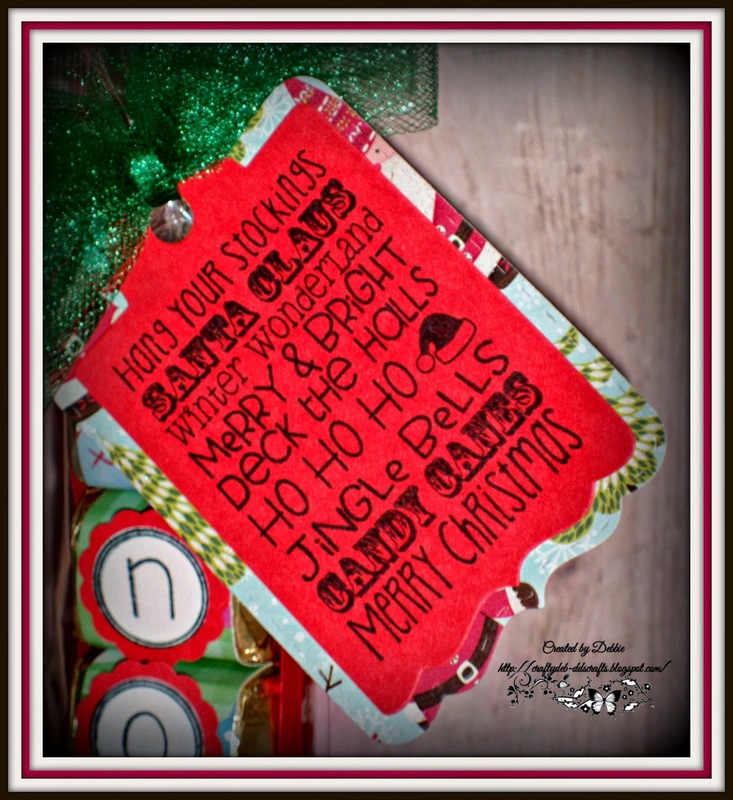 I myself do craft fairs, so I have a cute little and easy treat to share with you all. 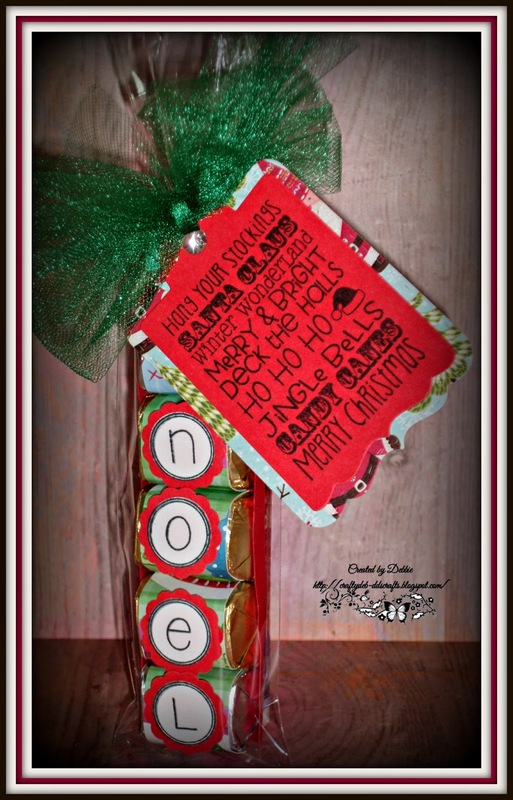 I will share all that I used from Jaded Blossom , and if you click on the link it will take you right to there store as well, ok here is all of what I used from the JB store..
Candy Wrap Dies, Treat Tag Die, Holiday Treat Tags stamps, and Alphabet Candies stamps. Now let's take a look at what I made. I took some Hersey Nuggets and wrapped them using the candy wrap die. Here it shows the Treat Tag Die, then I stamp the tag with using the Holiday Treat Tags stamp. Here is where I then used the Alphabet Candies, by stamping each one the nuggets making the word, NOEL. So see how easy and fun this would be to make, I also give them to co-workers, and others they just love them. I hope you have enjoyed my treats for today, and thanks again to Jaded Blossom having me as there e guest designer. Be sure to visit Jaded Blossom everyday this month for a chance to win! These are too cute Debbie! Debbie, these are awesome! Perfect for when you need to make a lot of little gifts!!! This is FABULOUS Debbie! Love how festive the candies look and the amazing sheer ribbon! Very sweet treat. Love the bow. Looks yummy!!! I really like that big green bow. Such a sweet treat!!! I bet that those would sell really well at your craft fair.. they are super fun! Love the green tulle bow!!! So cute! This is a great treat idea! Looks like a yummy treat box. What a great stocking stuffer present that would make. Adorable! What a great treat. Thanks so very much ladies I have really enjoyed this day! Cute treat, I love how the green tulle bow pulls it all together! this is so stinking cute! love all the details! perfect! These are awesome and I adore that tulle you used--definitely need to find some of that!